A new bike-sharing scheme in Hackney is “falling apart because of vandalism” less than two months after it was launched, according to one regular customer. Chinese firm Ofo introduced 200 of its “dockless” yellow bikes to the borough in early September for a year-long trial, following an agreement with Hackney Council. But local resident and Ofo regular Andrew, who did not wish to give his full name, says the scheme is “already being ruined by vandalism”. He said his numerous complaints to the company about bikes being “trashed” or “dumped in bins” are “not working”, and he fears “teenagers have found a way to hack the bikes”, which are tracked using GPS. In response, Ofo said it is “actively recruiting” more marshals, who round up and look after the bikes, as well as “upgrading security”. Hackney Council says Ofo has a “memorandum of understanding for a one-year trial”, which can be “cancelled at any time if standards are not met”. Ofo users have to create an account through the company’s app and can then unlock the bikes via bluetooth, paying 50p for every 30 minutes of riding. The cycles can be traced through the app and picked up from wherever they were left, unlike so-called Boris bikes, which require a docking station. Andrew said: “I want to raise awareness because I love the ethos of the scheme. It’s cheaper and more convenient than using a Boris bike, but unfortunately it is already falling apart – ruined by vandalism. “Bikes are constantly being trashed and left in bins or on estates. I reported four of these instances to Ofo just last week, on top of many previous complaints, but all they’ve done so far is offer me a job as a marshal. “I’ve had two of my own bikes stolen in the past three years, which is why I use these schemes so regularly, but my complaints to Ofo are not working. Ofo, which says there have been no reports of hacking, uses a geofencing system that means a bike must be parked in Hackney before that person is cleared to use the scheme again. Rival firm oBike faced criticism earlier this year after its cycles, which are also “dockless”, were ditched in problematic places. Hammersmith and Fulham council later said oBike had not properly consulted it prior to launch. Ofo’s UK operations director, Joseph Seal-Driver, told the Citizen: “We are working closely with the Hackney Council to ensure our service for Londoners is as robust as possible. We have 16 Ofo marshals on the ground in the borough and are actively recruiting more. Seal-Driver, who said the company has been encouraged by the response to the scheme so far, added: “All of our bikes are GPS tracked and where there are any instances of misuse our team is able to respond quickly. We have had no reports of any of our bikes being hacked. Commenting at the time of Ofo’s launch last month, Hackney’s transport chief Cllr Feryal Demirci said: “We are going to work with Ofo to make sure that users are given information on locations where they can park their bike in hot spot areas to prevent issues such as obstructing the footway and parking on busy narrow pavements. “We want to make sure bikes are parked in the best locations and understand journey patterns to make sure bikes are properly distributed. 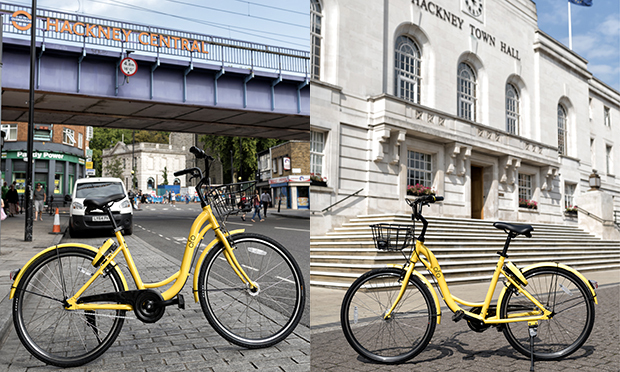 A spokesperson for Hackney Council told the Citizen that Ofo has a “memorandum of understanding for a one-year trial”, which includes stipulations about where the bikes are located, how often they are serviced, and whether they meet safety standards. Ofo must also liaise with the council before deploying more bikes. The spokesperson, who pointed out that Ofo users can be banned if they continue to park incorrectly, added: “The council is in regular contact with Ofo and there are monthly meetings between Ofo and representatives from departments including parking, enforcement and Streetscene.